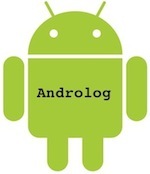 androlog is a customizable Log replacement for Android. Androlog supports Android 1.6+. This project is founded by akquinet A.G.
Androlog documentation is available on the wiki. Androlog is licensed under the Apache License 2.0.